The Form View lays out your form fields just like a paper form would. In fact, it is based on paper forms — in order to create a Form View, you must upload your paper form into GoFormz, and then overlay your digital fields on top of that paper form background. When building the Form View, you have a lot of flexibility in configuring the layout and each field’s appearance. The List View lays out your form like as a sequential list of standardized fields grouped into sections and tabs. This view is optimized for smaller screens, and has limited flexibility in field layout and appearance. The two views are independent of each other. You can create a form that works in both views, giving the user an option to fill it out using either layout — or you can create a form that works in only one of the two views. 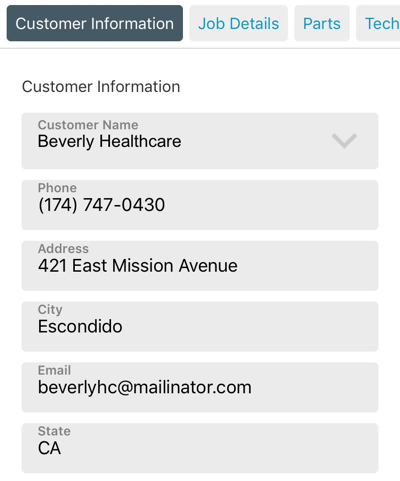 Mobile Form Editors (iOS, Android, Windows) support both views — you can switch between the two views at your convenience, provided that your form has both views properly built out. Both views will work across all mobile devices, but users often prefer the Form View on a tablet where there is more room to view a digitized paper form, while List View is convenient on a smartphone where screen sizes tend to be smaller and a list may be easier to navigate. The images below show the same customer information section in the two views. Note how different they look. The Web Form Editor uses only the Form View. So if you expect your forms to be filled out on a desktop device, make sure to create a functional Form View when building your form template.